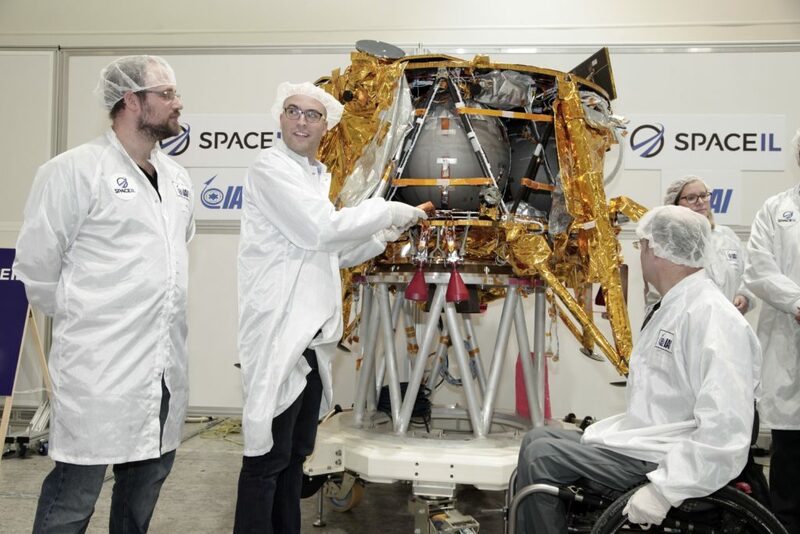 Photo: Courtesy of SpaceIL SpaceIL co-founders, from left, Kfir Damari, Yonatan Winetraub and Yariv Bash insert a time capsule into their spacecraft. (JTA) — He’s spent eight years trying to land a spacecraft on the moon, but when Yonatan Winetraub stood on the launchpad this month at Florida’s Cape Canaveral, he was still in shock. If Winetraub sounds like a kid marveling at the thought of space travel, that’s because he kind of is. He and two friends, all in their 30s, are on the verge of doing something extraordinary: They intend to make Israel the fourth country to land a spacecraft on the moon. Only the United States, the Soviet Union and China have done it. Winetraub and his partners, Kfir Damari and Yariv Bash, aren’t doing it with billions of dollars from a superpower government. In 2011 they co-founded SpaceIL, an Israeli nonprofit that has a budget of $100 million — a pittance in the space biz. If their mission is successful, it would be the first time any private spacecraft landed on the moon, at lower cost and with a smaller craft than previous landings. More like UberPool, the car pool option: Whereas Apollo 11’s 1969 trip to the moon took three days, SpaceIL’s will take about two months. That’s because it’s riding shotgun on another rocket and cannot propel itself directly to the moon. Instead it has to use orbiting to align itself, only meeting up with the moon at the beginning of April. About four minutes after launch, the SpaceIL craft, named Beresheet — Hebrew for “Genesis” — will separate from the rocket. It will send a first communication to SpaceIL’s ground control in the central Israeli town of Yehud and go into orbit around the Earth. Over the course of about a month-and-a-half it will hurtle through space at a maximum speed of more than 22,000 miles per hour. Its thrusters will push the craft in progressively wider and wider orbits around the Earth, and closer to the moon’s orbit. Then it will enter one of the riskiest steps of the mission. Once it gets near the moon, the craft must suddenly slow down enough to be pulled into orbit around the moon. If it goes too fast, it will pass right by, speeding directly into space. Then, after about a week of traveling around the moon, the craft will slow down again, dropping toward its landing spot on the Sea of Serenity. About 16 feet up, it will cut the engine entirely and free-fall to the moon’s surface, making a soft landing. SpaceIL’s founders are confident that the mission will be successful. But Winetraub acknowledged that it’s fraught. There were early hiccups. At the news conference, Winetraub wanted to show an inspiring video about the history of moon landings. Except the sound wouldn’t work. Then the sound came on, but the screen went blue. To even reach this point was an unlikely journey for SpaceIL, whose story is a quintessential Israeli startup tale. It was founded to compete in Google’s Lunar XPrize, a contest to see who could build the first private spacecraft to reach the moon. The co-founders submitted their application right at the deadline, Dec. 31, 2010, and went through a few failed experiments before building the right craft. The first model was the size of a Coke bottle. When that didn’t work, the team made the craft the size of a dishwasher. Now they’re up to a car. The XPrize shut down without a winner last year, but along the way SpaceIL received enough funding to keep going. It’s working in partnership with Israel Aerospace Industries, and its donors include the U.S. billionaire casino mogul Sheldon Adelson, South African-Israeli billionaire Morris Kahn and Canadian-Israeli real estate mogul Sylvan Adams. The mission has also become a kind of cause celebre. Buzz Aldrin, who knows something about getting to the moon, tweeted his best wishes Wednesday. His Apollo 11 mission landed on the lunar surface nearly 50 years ago. The spacecraft will raise an Israeli flag once it reaches the moon. It will carry a time capsule with the entire Bible printed in microscopic text on a coin, along with hundreds of other documents compressed onto small discs: dictionaries, encyclopedias, and Jewish and Israeli texts like the Israeli national anthem and the traditional Jewish prayer for travelers. The mission also will include scientific research. In partnership with NASA and The Weizmann Institute, an Israeli university, the craft will test the moon’s magnetic field in addition to taking photos and video. After two days the craft will be shut off and the mission will be complete. But SpaceIL doesn’t think its work will end there. The organization also hopes to inspire Israeli kids to go into science and engineering by showing them that space exploration is achievable. Its educational programs have already reached a million children, whom SpaceIL engages by asking them to help solve certain problems the craft might face, like how to stabilize with fuel sloshing around inside. The craft’s time capsule also will include drawings from Israeli kids. And SpaceIL is hoping to engage the Israeli public in the mission. There is even a Spotify playlist of Israeli songs appropriate for the launch featuring “Space Shuttles” by the Israeli singer Berry Sakharof. “It’s the first Israeli spacecraft, but hopefully not the last,” Damari, another co-founder, said at the news conference.